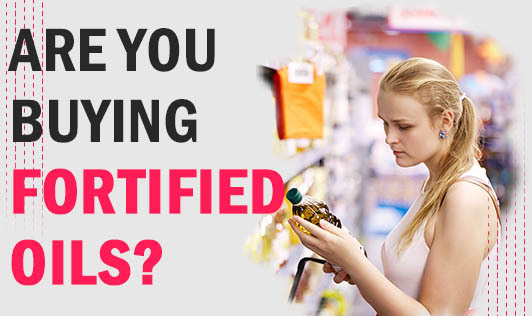 Are you Buying Fortified Oils? According to WHO, a large number of Indians are deficient in vitamin A. And no, it's not just related to the lower socio-economic strata, but also to the higher income groups! Vitamins like A, D and E are fat soluble vitamins, so can be added in the edible oils. Since oil is an indispensible ingredient of our food, fortifying it is a good way to incorporate these vitamins in our diet. There are many foods which can help to increase the intake of these nutrients. You can get vitamin A from all the green, red, yellow and orange fruits and vegetables. Vitamin D comes from direct exposure to sunlight and certain foods like egg! Vitamin E can be obtained by consuming nuts and oil seeds! Of course, now the cooking oil or the salad oil also will contain these vitamins. But don't stop eating the above listed foods! Buy a fortified oil to get a little more of those essential nutrients!